The weather has turned atrocious these last few days. 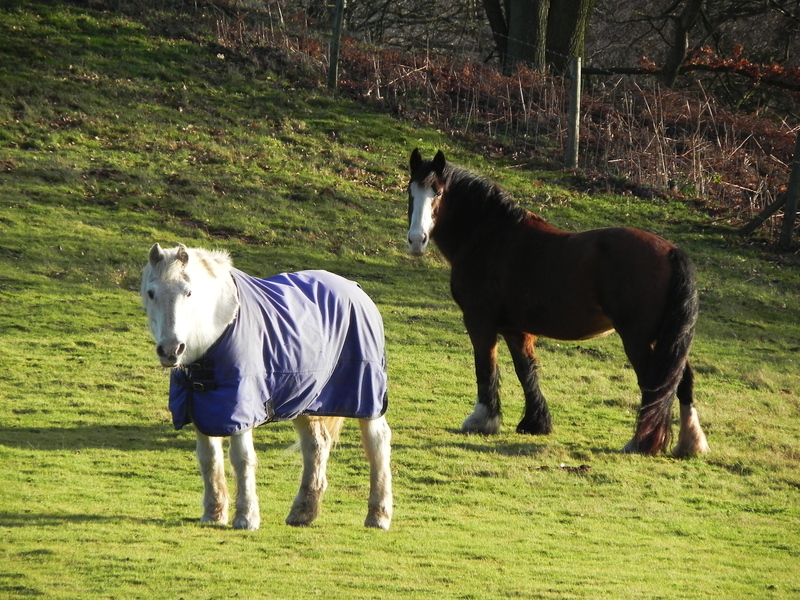 We had overcast, rain and very strong winds for a while, then two beautifully calm, and comparatively warm, sunny days. Last night the cold, violent winds were back – and this morning, just to avoid boring repetition, we woke to a couple of inches (and counting) of snow. And at this time? We have a lovely warm-ish sunny day and the snow is busy turning into slush as we speak. You know, it would be easy to think that, as the schools were closed because of the bad weather, the guy in charge in the weather room, had had to bring his children in to work with him – just to keep them out of mischief. I think he’s been called away to attend a meeting. Probably, because of the erratic nature of the current programme, there are serious issues arising from the need to keep the stock levels in the weather stores within the safe band. You see, the computer goes loopy when the levels fall below a certain value, and it spits out continuous printouts that spill all over the floor and make such a mess – to say nothing of the nuisance of having to keep refilling the paper tray, to stop the beeping noise the printer makes when it’s empty. 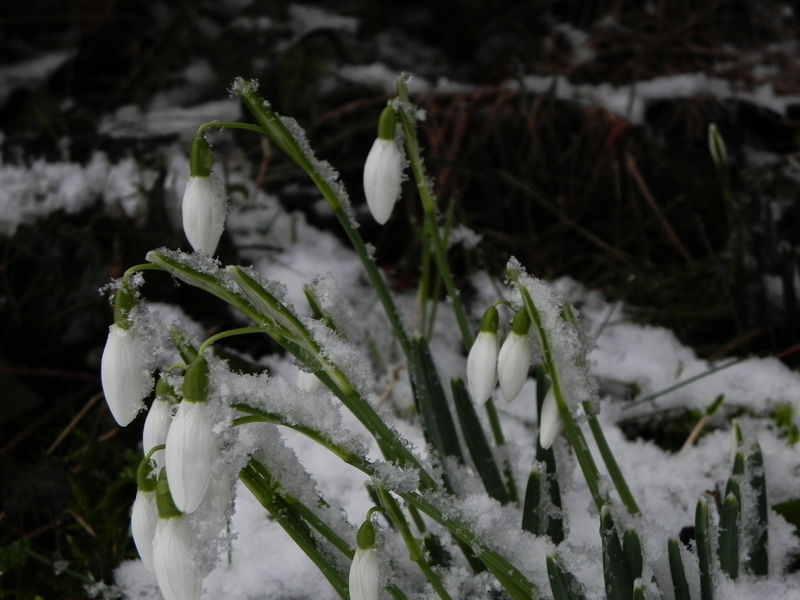 Anyway, as I was going to say up at the top there – we’ve had some snow, and I took a picture of some snowdrops. It just seemed to be the thing to do. We’ve been reading one of those terrible books. Instead of allowing us to gradually become more and more decrepit as the years pass, lazily, by – apparently we have to eat sensibly, drink less, and horror of horrors – exercise! It wouldn’t have been too bad if I had been able to keep it to myself. Disturbing tales of this sort do affect me deeply – but luckily, I’m resilient, and within a few days, a week or so at the most, I can recover my equilibrium, and return to normal. Unfortunately, I made the mistake of sharing the book with Jackie. 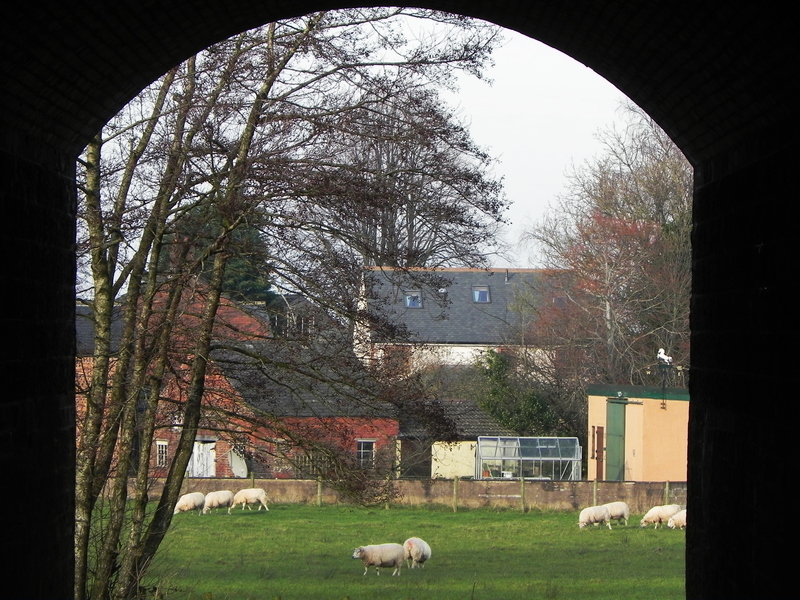 Now, on reaching the T junction – where previously, we would pause for a moment before retracing our steps – Jackie has decreed that we must extend our journey, briskly, down to the railway embankment and through the tunnel. When you turn and look back, from the other side of the tunnel, the great mass of the embankment seems to block out the sky. Then, you notice that the road disappears into the tunnel, and at the end of the tunnel is a small, bright spot of daylight. Taking your courage in both hands, you plunge into the gloom, while the weight of the whole earth presses down above you. (At this point, it’s often good to go “Hoo-oo-oo!” and wake the echoes.) As you progress through the Stygian darkness, the light at the end of the tunnel becomes brighter – as does the vista that opens up. There is an inspirational message here, but I’m not going to tell you what it is. Well! What excitement. We woke up one day this week to find that our electricity had packed its bags and tippy-toed away during the night. I hope it wasn’t something we said. Finding ourselves in a cold house, with no means of even making a comforting cup of tea, was an unpleasant awakening. Luckily we have lovely neighbours (who, irritatingly, still had the power on) so the cup that cheers was soon forthcoming. We’ve had a ferocious wind blowing in, straight off the Atlantic – via the width of Ireland, the Isle of Man and the Irish Sea – for several days now and this was our prime suspect, so I set about the process of restoration. First – out into the weather to check the fuse box. No luck there. 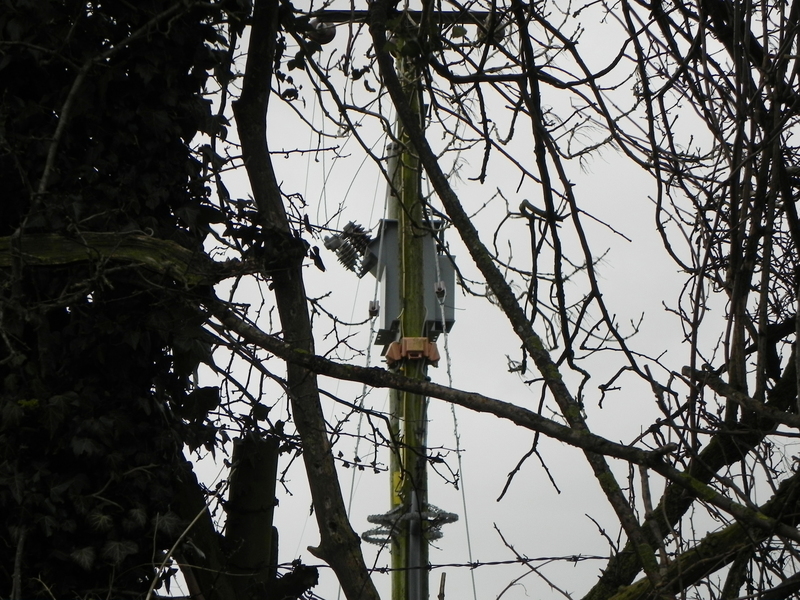 Next, a phone call to the people who look after the wires – “Oh no. You’re underground wires, it can’t be our fault!” Undeterred we phoned the people who use those wires to deliver the electricity direct to our door 24/7/365. A short while later I had a call back from the man – he was half a county away, it would be a couple of hours . . .
We decided to retire to the local supermarket to stay out from under their feet – and sit in the warm cafe with a cup of coffee. A couple of hours later I received a call to say it was all up and working. We were lucky. A great many people have had a far worse power cut for far longer than we had. So, to all those who were dragged out into the rotten weather on our behalf, and who thought they were just doing their job. By us at least, that day, you were truly appreciated. Thank you, each and every one. Have you taken the Christmas Decorations down? Hopefully, you will have by now. I’ve never really understood exactly what would happen if we left them up. Perhaps, we can negate whatever disaster is about to befall those members of the human race who haven’t yet had the time to climb up into the loft – to retrieve the empty boxes that house the decorations for the other fifty weeks of the year – by ‘Liking’ and ‘Sharing’ immediately on one of the many social media sites. I’m sure this will result in instant and constant ‘Good Luck’. Would it be enough to balance whatever we incur by our tardy behaviour, though? Perhaps you have been too busy visiting the January Sales to devote time to dismantling, unsticking, unpinning – and the fruitless task of trying to remove whatever you used to stick things up with – without removing half the wall. I went to the sales once or twice – before I noticed that the stuff on sale was only the stuff that no-one wanted to buy before Christmas. This had all been piled at the back of the shop in December. In January it came into its own. Any of the popular items that remained from the stress and angst of a Friday of a different colour, were now moved to the back. The unloved merchandise from the back was moved to the front, and adorned with large, colourful labels. 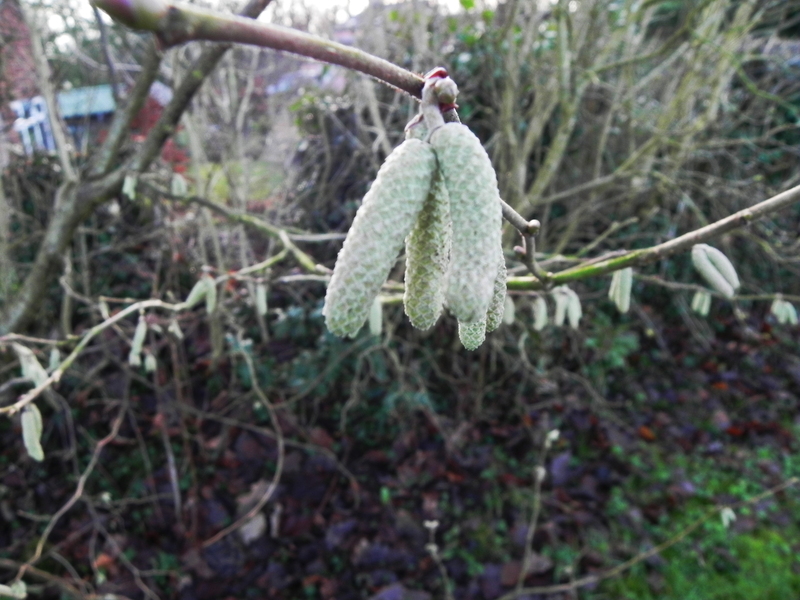 The hazel bush in today’s picture has been to the sales. When it got home, it found it had one like that already – probably bought in last years sales – so it hung it on a hook by the door. At this point in time it would be easier to offer an insight into what could be expected from 2014, however, not deterred by common sense, let us stride forth from our comfort zone into the mists of the year ahead. My first glance into the crystal ball reveals that we can expect the early part of the 2015 to be dominated by people writing predictions for the coming year. Those who tweet their forecasts will fare best, as within a few minutes, their twittering will have dropped off the end of the screen and no-one will even remember that they dabbled in prognostication. Social media vaticinators will not do so badly either – their posts will probably not appear at all, given that only twenty percent of posts are actually allowed through the filters. Those that successfully run the gauntlet of what computers consider to be right and proper for real people to read, will be virtually swamped by adverts and posts from commerce and industry. The only danger, really, is the annoying habit these social sites have of regurgitating old posts, for no apparent reason, at random intervals. Make sure your black cat is purring before you hit the ‘Post’ button. Those who commit their adumbration to their blogs – Beware! It is all too easy to look back to last years posts. I predict that you will rue your prophecy. So, some sunshine, occasional rain, and quite calm if it isn’t windy. There you have it, straight from the horses mouth.